In the past the capture of wild dolphins was allowed so that they could be made available for public viewing. Today that practice is all but ended, as husbandry programs to breed dolphins in captivity have become so successful. In order to maintain healthy breeding outcomes and avoid in-breeding, new dolphins must be introduced into a captive facility's stock now and then. 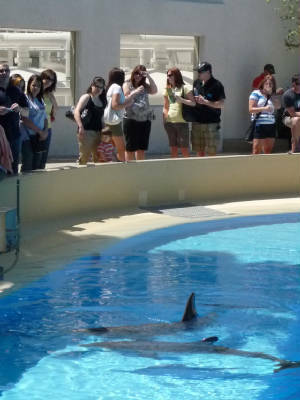 Dolphins are often "loaned" by one facility to another for such purposes. Where long distances between facilities exist these animals are transported by air. The dolphin is gently placed into a device such as this. 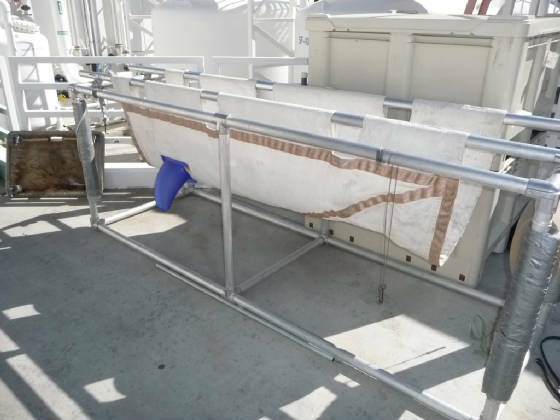 The device is designed with solid sides, ends and bottom so that the animal being transported is surrounded by salt water. Technical staff familiar with and bonded with the dolphin being transported are constantly present during the transport process so that the animal is kept comfortable and stress held to a minimum. The Atlantic Bottlenose Dolphin is the most common captively held dolphin. The first record of a Bottlenose dolphin captured for display was in 1883 in Europe. Since then wild animals have been caught and transported to marine park facilities. This practice is all but eliminated today. It is estimated that from 1986 to 1989, 2,700 dolphins were captured for commercial display purposes (1,600 in U.S. waters and 600 in Japanese waters). As of 1989, no further permits have been issued for the commercial capture of wild dolphins in the U.S. But, live captures still occur today in Japan, continuing the controversy over this practice. Members of this species adapt to and do well in the captive environment. They live long and healthy lives (on average, longer than in the wild) and have a high reproduction rate. They are playful animals, exhibiting a natural curiosity. Strong bonds are formed with their human counterparts. There is much that goes on in the life of the dolphin that we will never see or that is difficult to see in the wild. A controversial topic is holding dolphins in captivity. A recent Harris poll has shown that over 95% of the people polled feel that properly maintained and run marine mammal parks provide a heightened appreciation for and understanding of these animals and add to the efforts in their conservation as a species. 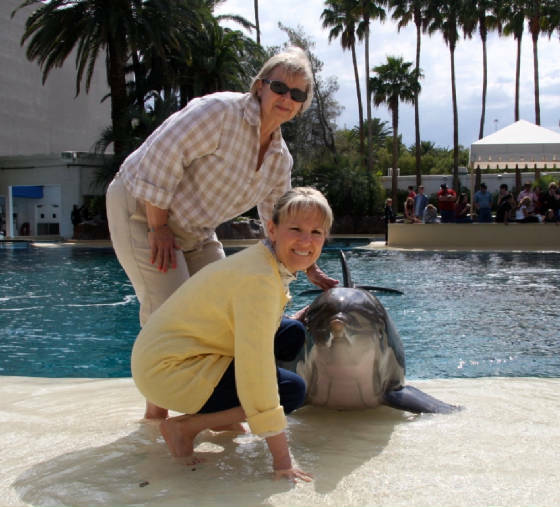 With 126 million visitors to dolphin habitats each year, the opportunity to teach appreciation for and conservation of the dolphin is tremendous. (1) We have learned most of what we know about dolphin echolocation, hearing, diving, senses, thermo-regulation, birthing, and social interaction with captive dolphins. (2) Information learned by working with captive dolphins has led to our ability to help stranded and other wild dolphins throughout the world. With man’s help, the survival rate of stranded dolphins has increased in the past few years from only 10% to 30%. A study of Atlantic Bottlenose Dolphin life span in the wild carried out by the Alliance of Marine Mammal Parks and Aquariums has shown that there is 30% mortality in their first 12 months due to maternal abandonment, pollution, predation, boat strikes, entanglement in fishing equipment, capture for human consumption, and disease. In the wild, the average life span of the Bottlenose one year or older is an average of 25 years. In captivity, Bottlenose dolphins live an average of 30-35 years, having veterinary care, non-polluted water, no predation, no boat strikes, quality controlled food, no fishing equipment in which to become entangled, and careful observation and support of the birthing and mothering processes. In a survey taken in 1983, 32% of all dolphins being held in captivity had been born at a captive habitat. Institutions which offer educational programs (both formal and informal) to school children and adults develop in the visitor an appreciation for this beautiful species, an understanding of its behavior, and an awareness of the need to protect it and all life in our oceans. Captive habitats in the U.S., Europe and Australia are committed to good care, cooperative breeding and improvement of the dolphin gene pool. It is my understanding that, in these countries, no wild dolphins have been captured for institutional use for the past 30 years. REMEMBER, WE CAN'T PROTECT AND CONSERVE WHAT WE DON'T UNDERSTAND. 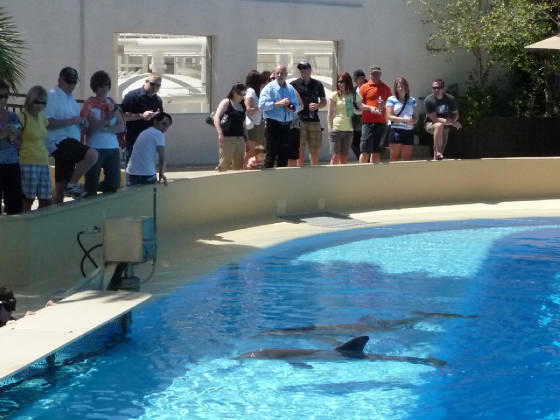 Studying Bottlenose dolphins in captivity provides one important means for this understanding.